Title: Study of End fire array antenna. Apparatus: Matlab software, PC, Printer. The end fire array is nothing but broadside array except that individual elements are fed in, out of phase. Thus in the end fire array, a number of identical antennas are spaced equally along a line and individual elements are fed with currents of equal magnitude but their phases varies progressively along the line in such a way as to make the entire arrangement substantially unidirectional. In other words, individual elements are exited in such a manner that a progressive phase difference b/w adjacent elements becomes equal to the spacing b/w the elements. End fire array defined as: the arrangement in which the principal direction of radiation coincides with the direction of the array axis. It may be noted that end fire array may be bidirectional also. Consider n no. Of identical radiators supplied with equal current which are not in phase, as shown in figure. Assume that there is a progressive phase lag of Î²d radians in each radiator. 2. Calculate WAVELENGTH Î» = C/F WITH (c=3*108m/sec). 3. Enter the distance between Elements d.
4. Plot polar graph Î¦ vs. AF. 5. Calculate non-normalized AFâ€™ = N*AF. 9. Calculate FNBW, HPBW, FSLBW using given formulae. In END-FIRE ARRAY ANTENNA the maximum radiation is always parallel to the axis of antenna array i.e. 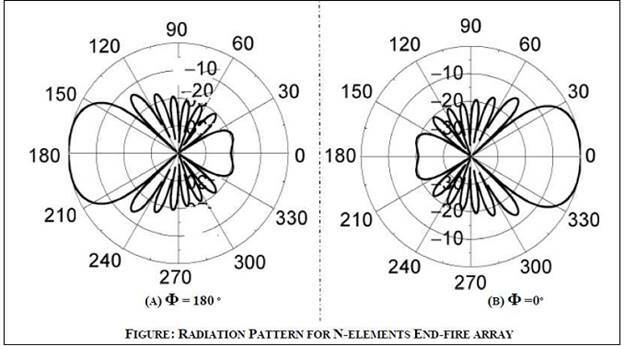 at either 0Âº OR 180Âº and the maximum radiation can be obtained by increasing the number of elements..
Students will able to model the End fire antenna, compute the performance parameters and compare the performance parameters with standard parameters. What is an â€œarray factorâ€? What are the types of antenna arrays? What are the applications of arrays? direction that is in the direction of array axis. What is an array and mention the various forms of antenna arrays? What is array factor or space factor? Write the principle of pattern multiplication? Define the length of an array? What is a collinear array? Which are the controlling parameters of the overall pattern of antenna array? Why antenna arrays are required? What is uniform linear array? What is the effect of changing the number of element on the radiation pattern of an antenna array? What is the effect of changing the spacing between adjacent elements on radiation pattern of an antenna array?